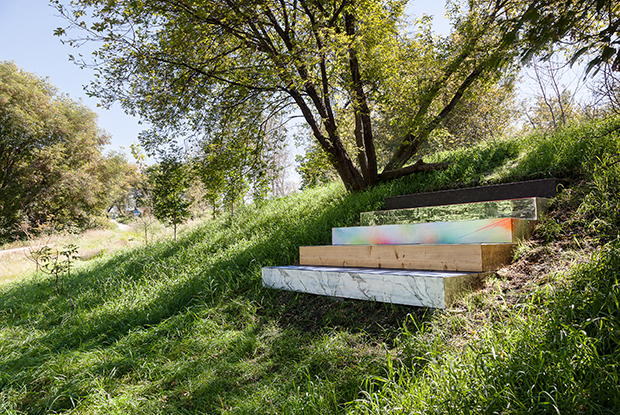 The site-specific installation at the Forks is a multi-colored geometric structure that will perform double duty: the work will function both as sculptural intervention and as a space for visitors to sit, read, contemplate the surroundings and enjoy impromptu gatherings or performances. 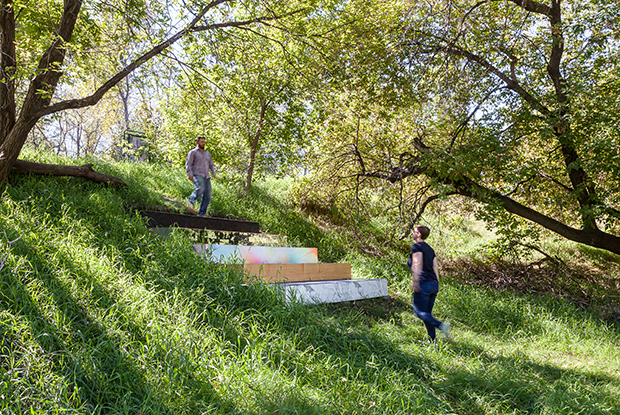 The work uses context, scale, color and pattern to transform the perception of the “amphitheater”; a common architectural typology found along Winnipeg’s riverbanks. By expanding a series color/patterned stripes into a stepped form, a range of graphic conventions encounter the riverside context, providing a strange juxtaposition with the surroundings, but also a human proportioned interpretation of the slope. Like a folded piece of paper, the installation activates color and pattern to create a semi-public space scaled for hanging out at the river’s edge. © Witthöft & Latourelle 2019.